The ambient MP3s cost .99 to 2.99 and are available from CD Baby. You can download these MP3s to your ipod or MP3 player and relax to nature sounds. Click on the CDs/MP3s to learn more and hear a sound sample. 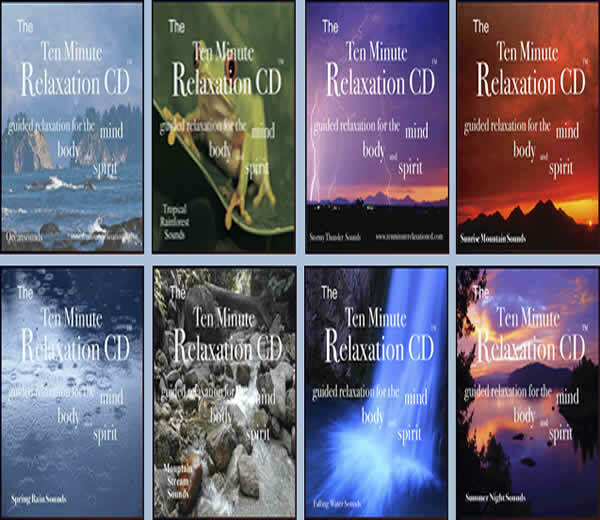 The Ten Minute Relaxation CD/MP3 allows you to relax in ten minutes, via guided relaxation to refresh the mind, body and spirit. The Ten Minute Relaxation CD/MP3 also contains nature sounds so you can relax to the sounds of the ocean, a tropical rainforest, babbling brook, or even an oscillating desk fan.If you follow the guided commands, you will relax. This CD/MP3 is a form of self hypnosis where you are simply asked by a narrative voice to give yourself permission to relax, thus leaving you in control. You can bring yourself out of this relaxation any time, just by willing it as well as alert and vibrant with no side effects, at any time. These CDs/MP3s have "waking commands" to bring you back from your relaxation, or you can ignore these commands and use the CD/MP3 to help you fall asleep. The audio also has positive affimations to help you grow and be who YOU want to be. You can also add your own personal positive affirmations when asked to do so. Learn how to make your own positive affirmations by downloading the free mp3 or click here (Learn how to use the CD) for further instructions. The CD/MP3 also contains ambient nature sounds mixed with the narration and a subliminal track accompanied by nature sounds. Finally, there are also thirty minutes of nature sounds that you can use as background sound while you work, sleep, or just meditate. If you suffer from tinnitus, the ambient sounds can give you some relief so you can sleep. Try the Ten Minute Relaxation for 30 days with a money back guarantee. It is used for alternative healing and it is in use by The American Lung Association for their smoking cessation programs.